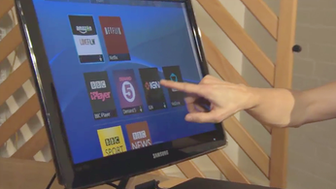 BBC WebWise - What is smart TV? TVs have been getting bigger and better in recent years. But keeping up with the latest developments can be a bit of a challenge. Here are a few pointers to help you as we take a look at the next big step in TV technology - 'smart TVs'. A smart TV is a TV with integrated internet capabilities. This means that as well as doing the job of a normal digital television, it can also do the job of a DVD player and a music player, and it can do a similar job to a computer. It's pretty clever. Print: What is smart TV? A smart TV needs to be connected to a broadband internet service using a router and an ethernet cable. Some sets will allow you to connect wirelessly using your home Wi-Fi. However, you may find that the speed of your Wi-Fi connection is not fast enough to provide video services. If you experience problems with video streaming on your smart TV, try to place your set as close as possible to your router. With 'video streaming', a continuous stream of data (which produces the picture and sound) is sent via your broadband connection. If there are problems with your broadband speed, the video may keep pausing ('buffering') as you watch it. Just remember - the closer you place your smart TV to the router, the faster your connection speed will be. And once you're connected, you're all set to experience the benefits of smart TV. Simply browse the menu pages, which will include a series of pre-loaded apps ('app' is short for 'application' and is a type of computer program). Then select your chosen app by pressing the 'Enter' or 'Select' button on your TV remote control, and away you go. You can watch something on BBC iPlayer or choose a movie from a subscription site like Netflix or Lovefilm. You'll be watching on your full TV screen - so it's a different kind of experience to viewing it on your computer. You may be able to access social networking sites such as Facebook or Twitter on your smart TV. If your smart TV has a built-in webcam, you can use a video chat program, such as Skype, to connect with friends and family anywhere in the world. Not all smart TVs have this function, so you may need to buy a webcam separately. Many smart TVs let you surf the net via apps found on the menu page. You use your remote control to type in text. 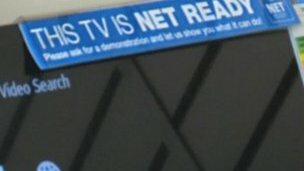 Some smart TVs allow you to visit any website you like, just as you can on your computer. So if you do think a smart TV is for you, make sure you do your research - just as you would with any other purchase. You'll need to take a look at exactly what features each brand has - and work out what's important for you. Don't worry if you're feeling daunted by all this talk of hi-tech TVs. There's plenty of help and advice available on the websites listed below. WebWise: What is connected television?